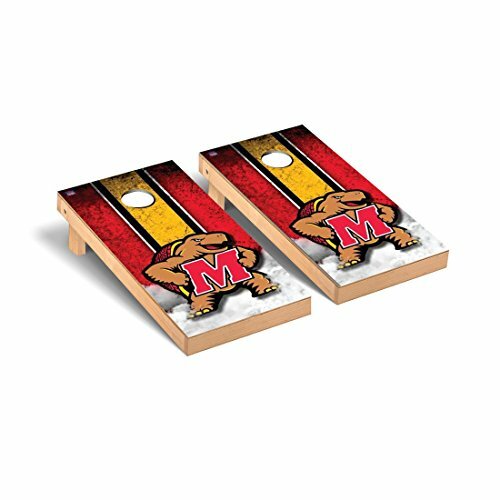 VT15295 NCAA Team: University Of Maryland Terps Features: -Includes two game boards. -Includes complete bag set (8). -NCAA collection. -Real wood, heavy duty. -Strong premium 2 x 4 frames. -Folding legs made of 2 x 4. Material: -Metal/Manufactured wood. Number of Items Included: -10. Country of Manufacture: -United States. Dimensions: -Regulation size 24" x 48". Overall Height - Top to Bottom: -10". Overall Width - Side to Side: -25". Overall Depth - Front to Back: -50". Overall Product Weight: -64 lbs.